Crafting is the way to make Cookies in Minecraft.The player will first need one Crafting Table. It can be made by opening your inventory box and placing 4 Wooden Planks into the 2×2 grid located in the top right corner. Once all of the Wood are placed in the boxes you should see the Crafting Table appear to the right of the Grid. Right click on the crafting table to put the item into your inventory. If you just made the crafting table then you will need to equip it and place it on the ground by right clicking an open area around you that you would like it to be at. Next the player will need to open the recipe to Make Cookies. The recipe for a Cookies is 2 Wheat and 1 Cocoa Bean. Wheat is made from farming Wheat Seeds or found in Chests. 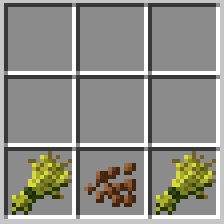 Cocoa Beans can be found in Jungle Biomes hanging on the trees. You are also able to farm Cocoa Bean by placing one on a Jungle Wood. This will produce between 2 to 3 Cocoa Beans. Now that you have learned how to make Cookies in Minecraft, they are made in sets of 8 and can restore 1 hunger per each. This makes them very efficient compared to how much ingredients it takes to make them.